BlackRadioIsBack.com Music: Basicali | BlackRadioIsBack.com - Official Blog of the Syndicated FuseBox Radio Broadcast! While a whole lot of Hip-Hop albums have dropped mainstream wise this week (most of which are good to pretty fly w/ a bit of overhype), I always like the concept of music that dops which is quality and free in this 21st century age. 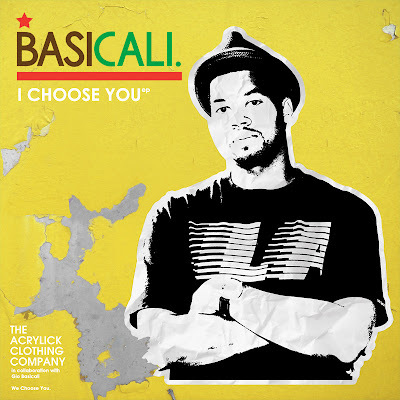 Through our peoples over at Acrylick Clothing (pretty cool gear, by the way), I ran into this West Coast Hip-Hop EP from MC Bascali called the "I Choose You EP", which has some pretty on point lyrics, rhymes and positive & fun vibes that aren't preachy or cheesy (with some kocnking beats as well). Check out the "I Choose You EP" download below along with a video or 2 of Bascali in action and let us know what you think!